for wild, exhilarating and action-packed sports. Damien Michael A Lane is an award-winning composer, songwriter and multi-instrumentalist. He was the recipient of the 2017 APRA Professional Development Award, and in 2015 won an APRA/AGSC Screen Music Award for the film ‘1919’. He has a background as a performer, primarily on guitar, and as a songwriter has contributed to soundtracks for feature films and documentaries. “When commissioned to write 101M037 Sports Extravaganza for 101 Music Pty Ltd, my intention was to create propulsive, high-energy tracks to accompany fast-paced action. Many of the guitar and keyboard tones have a fluid quality to them which works well with competitive field sports, water sports including surfing, snow sports, racing, extreme sports and the like. The brief was action-packed and hard-hitting rock music to get the blood pumping. “The tracks often began with a driving bass-line or drum kit where the bulk of the guitar riffs were improvised over this and later refined with acoustic piano, acoustic guitar, Hammond B3 organ or synths added later. “The main guitar used was a Gibson ES-135 hollow-body electric, with overdubs on a customized Hagstrom Viking Deluxe Baritone electric guitar and a Godin xtSA guitar and synth controller. The amps used include a Fender Hot Rod Deville and Roland Blues Cube. The electric basses utilized were mostly a Rickenbacker 4001 and a Hohner PJ series”. Working with Damien was a real joy as his ability to understand the brief and deliver consistently solid product was most proficient. 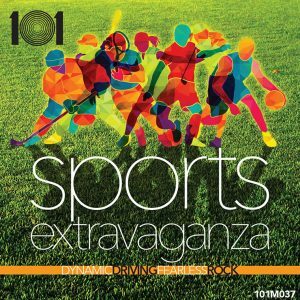 This album is a welcome addition to the 101 Music Pty Ltd catalogue and I trust that you will find successful placements for this copyright in the ‘wonderful wide world of sports’ television and radio broadcasts, event highlights and any sort of high-energy advertising. The project is organic, incorporating a live rock band featuring the genres of grunge, hard rock, indie rock, alternative rock and metal – mastered by the ‘sonic audio master’, Kathy Naunton of dB Mastering (Sydney, Australia).